Vultr is one of the cheapest cloud providers for reliable cloud servers with a bunch of operating system choices to launch on your machine. They have various data center locations around the globe to achieve low latency, thus help the users choosing the most suitable geo-position according to their target audience. After using them for a while, I discovered some cons listed below which might urge potential users to search for Vultr alternatives. Chances are you may neglect the later one but the first point can be the most agreed concern of many users. Due to different usage, different users can have other problems with Vultr to look for similar services. InterServer is somewhat different than other hosts mentioned here as they are not only offering cloud VPS but also different types of web hosting services including shared, dedicated, colocation, and reseller with guaranteed uptime. The best news is they provide support services through live chat, phone, and ticket around the clock 24/7 on a priority basis. The company is operating since 1999 as an independent host and in business for the last 19 years. Their goals are ensuring bullet-proof security, reliability, stability, and technical expertise to all users. The entire infrastructure powered by 10Gbps network connections and multi-tier 1 IP backbone providers for maximum throughput and uptime guarantee. Interserver utilized N + 1 network upgrade to intermediately route servers connectivity to another spare link in case of an unpleasing situation. Though they do have automatic fail-over measures but it helps them to ensure maximum SLA. Moreover, the BGPv5 routing protocol is another factor that helps Interserver deliver blazingly fast speed, lowest latency, and awesome user experience. When it comes to cloud hosting services having various data centers across the world is always best. So, to stand against other hosts in the industry, they also have multiple data centers to choose from. However, the total amount of centers is much lower than Vultr and other competitors. The company has 5 start rating by many reviews sites and A+ BBB rating as well. You can pick from Linux or Windows VPS as well as can install from other 100+ apps on your virtual machine. All plans also come with one-click app installer such as WordPress, Magento, Joomla, etc. and billed on month-to-month. Interserver migrates your existing website at no fees with zero downtime. Additionally, to manage your hosting server and sites, you can deploy cPanel and Softaculous at low cost. They give no refund policy because of the monthly based billing system, but you can try at just 0.01$ for the first month here. Support Suse, Debian, Fedora, OpenSuse, Ubuntu, CentOS, Windows, etc. Before starting the DreamHost review, let me ask a few questions. Do you need more storage capacity than Vultr for your cloud hosting server at the affordable price? Do you prefer to have a giant storage block to upload extensive data? If so, then DreamHost’s DreamComput plan could be the right option for you. Why? Because they offer a giant 80GB SSD based space and free 100GB block storage at an insanely lowest cost- only $4.50/month, Isn’t it cheapest Vultr alternative? DreamHost has been serving the customer since 1996 and now handling more than 1.5 million websites under their management. Moreover, more than 400k+ happy users utilizing their platform to host domains and apps. It’s a Los Angles-based company that also offer shared, managed WordPress, Virtual private, and dedicated servers as well. All of their cloud servers built with SSD hardware to deliver lightning-fast loading speed, latest processors, ultra-fast network connectivity, and major OS distributions. You can utilize Node.js, Linux, Windows, Ruby, MongoDB, Redis, OpenStack, Python, and other templates. It won’t take hours to set up your virtual server, and within 30 seconds you can configure and get online – instant provisioning. There are three packages choices right now to choose from. The basic one holds 80GB SSD space, 512MB Ram, 1 vCPU, and free unlimited bandwidth. All accounts also accommodate a free 100GB storage as mentioned above. DreamHost provides customer support via live chat (specific hours), tickets, and phone call-back. All of these perks are covered by a 30-day refund for monthly based accounts and 97 days for annual subscriptions. CloudWays is one of the top places to launch your cloud instance with few clicks just like Vultr. Basically, they are serving cloud hosting from other providers such as Amazon Web Services, Google, KYUP, Linode, and Vultr, etc. and operating as infrastructure as a service (IaaS). So, they don’t have any servers but provide customer service round the clock via multiple ways. You can contact them 24/7/365 using live chat, phone, and tickets. Compared to Vultr, CloudWays plans are high priced than its competitor because of instant live support. On the other hand, it’s a “one-stop shop” where developers, webmasters, and bloggers can deploy their virtual cloud in no time with a bunch of operating system choices. To make things quicker and easier, the company has built one-click feature for cloning, backup/restore, application installation, domain mapping, and resources scaling. They are not focusing only on developers friendly environment but also bloggers and webmasters as they do offer one-click CMS (WordPress) as well as SSL certificate installation. Futhermore, for encrypted data retrieving, you get HTTP/2 enabled servers for faster SSL handshake to reduce load time. The basic plan costs $7/month with 20GB SSD storage, 1 Core CPU, 512MB RAM, and 1TB bandwidth. Free security certificates and unlimited applications installations included for all accounts. DigitalOcean is a rapidly growing cloud company that offer numerous locations and a broad range of operating systems to help IT professionals and app developers launch their server under 55 seconds. They were one of the first cloud hosting providers that utilized solid state drives for cloud instances to deliver seamless performance. Though DigitalOcean has an intuitive panel to install preferred OS easily but bloggers whose primary concern is establishing WordPress must have some technical knowledge. Because activating WordPress on your domain required command line know-how. So, DigitalOcean is much friendly and reliable option for professionals. Their simple yet powerful API can be integrated with your applications to launch your droplet (server) or scale resources to handle large production loads on the go. Plus, make use of “Load Balancer” to manage substantial traffic spikes for maximum availability of your apps/sites. It works out of the box which means no messy configurations will require. You can also monitor and analyze deployed apps with performance optimization alerts to improve the user experience. They are employing redundant network connectivity of 40Gbps for each machine to ensure ultra-fast speed and uptime. The very first plan packed with 1 vCPU, 512MB Ram, 20GB SSD volume, and 1TB data transfer at the cost of just $5/month. It’s expensive than Vultr though. Indeed, Digital Ocean won’t be the best Vultr alternative if you prefer to have live support as they also don’t offer it – only tickets. Trusted by giant names like Redhat, Xerox, JQuery, Ericsson, Zendesk, etc. Host1Plus is another excellent alternative to Vultr but good for tech experts because they provide un-managed cloud solution which means you’ll have to configure everything yourself. Right now, empowering more than 70k clients globally including PureVPN, Fedora, Avast, ExpressVPN, AFRINIC, and IVACY, etc. They are using KVM virtualization technology to isolate cloud machines for resources allocation which helps to maintain performance. Like Vultr or DigitalOcean, you get limited data center locations with Host1Plus as they only have four spots. However, there are numerous operating systems to choose from, but everything is manual. The company also offer managed services in which they will set up things for you but at extra fees. In my personal experience, as a newbie or beginner user, don’t go for it. On the other hand, experienced users who prefer to have complete control can surely try Host1Plus. Talking about system specs, you get latest Intel Xeon processor equipped server with DDR4 Ram, KVM virtualization, IPv6 and IPv4 support, API access, 10G connectivity, and of course SSH access. You can install Windows or either Linux OS, but it’ll require paying a small fee for Windows license. Their “LIN1” plan comes with 20GB disk space, 512MB Ram, 1 Core CPU, and 2TB monthly bandwidth at the price of $8/mo on a monthly basis. You can get a significant discount on an annual subscription. Support team assists you 24/7 by chat and tickets. Used by big internet names Fedora, etc. When we compare the global datacenter locations of CloudSigma and Vultr, the later one has more positions whereas CloudSigma has the edge over support because they offer live chat for technical help along with a free seven-day trial account. It also not required credit cards and you get instant access. Their hosting environment allows running an unmodified OS such as FreeBSD, Linux, Windows, and others. You can install a custom image as well for maximum outcome. CloudSigma provides solid state drive for data storage, custom KVM virtualization, notification alerts, and massive 128GB RAM for large-scale loads. All machines are powered by 10G network connectivity to ensure maximum availability and uptime. Deploying a virtual machine won’t take more than 30 seconds which means instant launch, instant production. Plus, flexible cloud provisioning allows “on the go” resources sizing to increase system power as per load. So, developers can run resource-intensive apps with zero downtime. Regarding plans and pricing, they are quite affordable and charge reasonable prices. There are no fixed or bundled plans to choose from; you’re free to make custom one as per your requirement. They enable users to pick custom RAM, Storage, CPU, etc. to avoid paying for unused services. CloudSigma charge on hourly or monthly basis for only consumed resources but keep in mind, if you hire a virtual machine and put it on sleep then you’ll have to pay for that as it’s in your control. When it comes to technical support, there are various channels to get in touch – chat and community forum, etc. Do you prefer to have a command line or terminal access to your virtual machine? If so, Linode would be an excellent option for you. Their plans are also similar to Vultr with the almost same configuration. Linode offers a simple CLI feature to manage your cloud instance using shell commands. It was founded back in 2003 by Christopher Aker and now empowering more than 400k users worldwide. Like other competitors on this list, they also use SSD’s for fast data retrieving. Linode has 9 data center positions in 3 regions to help webmasters launch their virtual cloud machine in the target geo-area. You might be aware that short distance to hosting server plays a vital role to minimize loading time. So, having a bunch of choices is always good to make your websites and applications work faster. Linode supports a variety of distributions such as Fedora, Arch, Ubuntu, CentOS, Debian, Gentoo, Slackware, and OpenSUSE, etc. as well as custom image. The very first package starts at $5/month which is packed with 1GB of Ram, 1 Core CPU, 20GB SSD storage, and 1000GB monthly bandwidth. Other notable features are; 40Gbit network, advanced Intel processor, rescue mode, cloning, and easy DNS manager to set up your domains. Their modern control center built in a way to set up things like NodeBalancers, Longview, and Backup services within few clicks. They maintained an intensive knowledge base, dedicated community, and live chat for quick assistance. 24/7/365 live chat, tickets, etc. 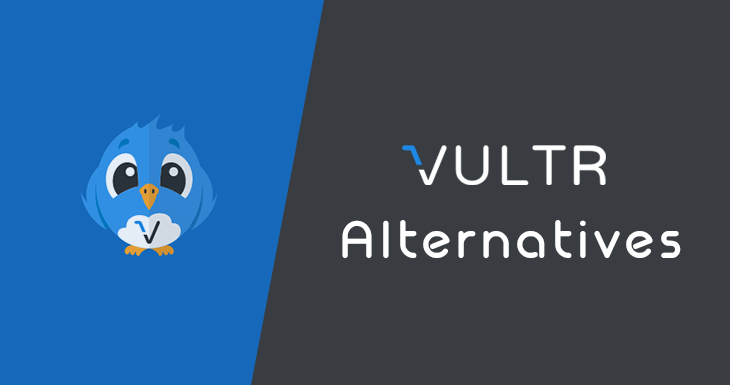 Now Which is the Best Alternative to Vultr? Bloggers and Webmasters can choose DreamHost for well optimized and high speed performance along with 100% SLA as claimed by the companies. Developers can choose Host1Plus for full control – they offer unmanaged solutions. However, DigitalOcean is also a considerable option as well. Selecting the best cloud provider entirely depends on your needs, how much system power your website or app will require to work smoothly, figure out your essentials before making a decision. Mostly, hosts allow flexible plan creation calculator to help the users build preferred one to avoid overpaying for worthless services. For example; CloudSigma doesn’t have any pre-made packages to choose from – after the signup, you’re free to configure one according to volume, CPU, Ram, and monthly bandwidth. It’s an excellent feature regarding saving some bucks. So, which Vultr alternative you think is the most appropriate one and why? Please do share your suggestion below in the comments.